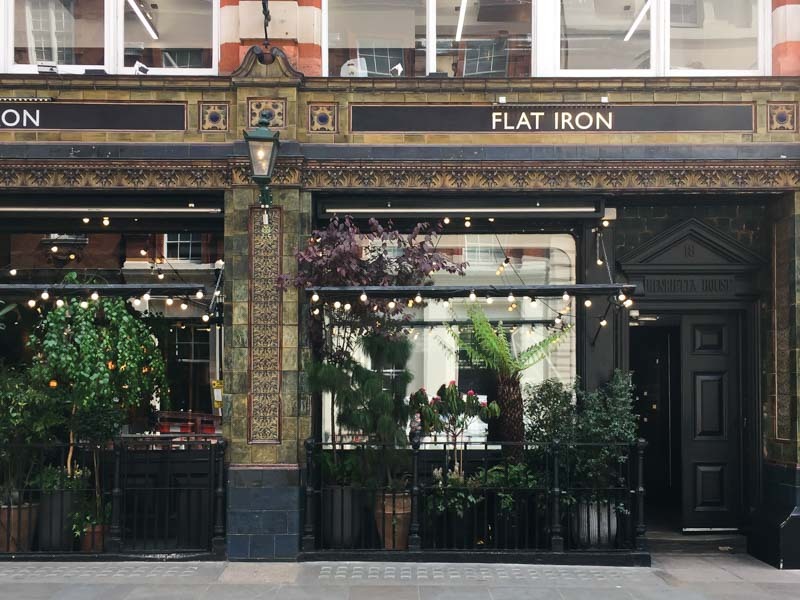 If you’re Singaporean and you love going on holiday to London, chances are you’ve heard of Flat Iron. 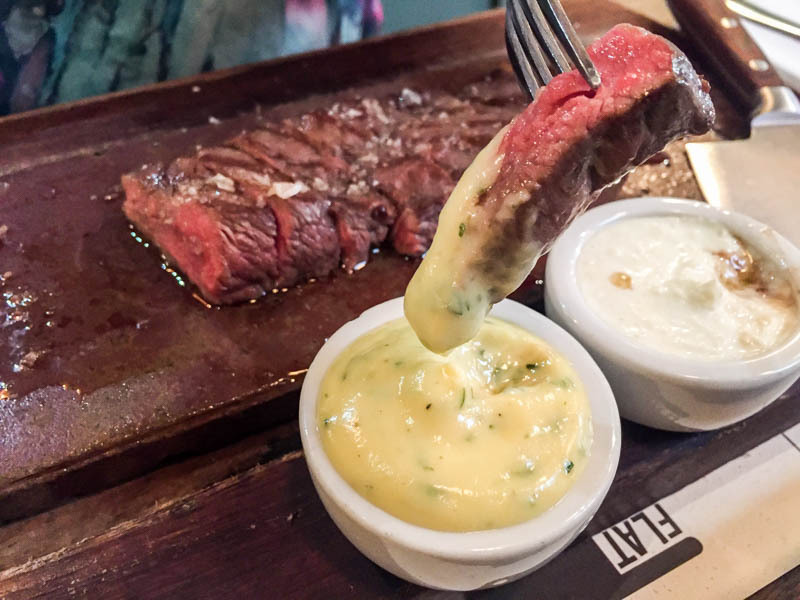 This steakhouse’s claim to fame was serving up £10 (approx. 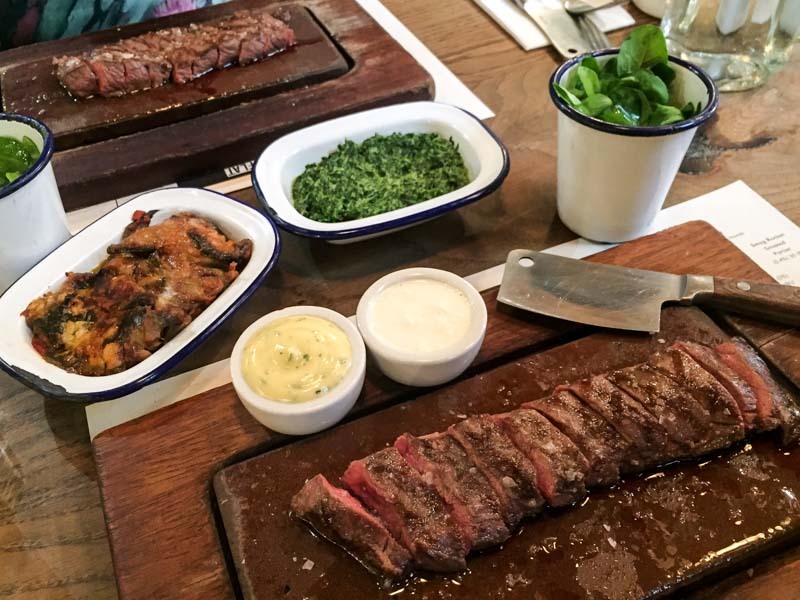 S$17.90) steak in decent portion sizes – something pretty unheard of in Central London. Because of inflation/demand/other-reasons-why-all-good-things-come-to-an-end, the famous steaks now cost £11 (approx. S$19.70), which is still pretty good value for money. 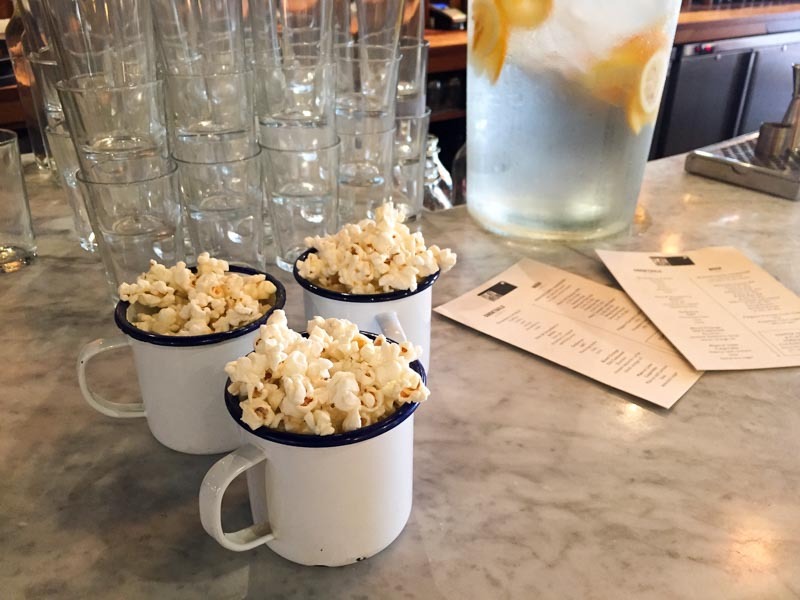 There are a few outlets in London, but if you’re planning a visit, you must head to the one in Covent Garden. Why? 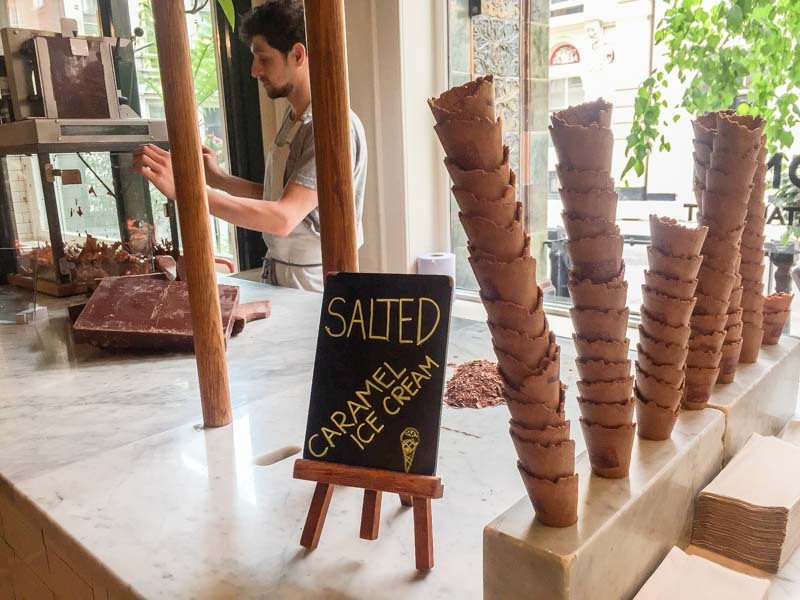 Because that’s the only outlet that offers a FREE scoop of delicious Salted Caramel Ice Cream after your meal! But more on that later. 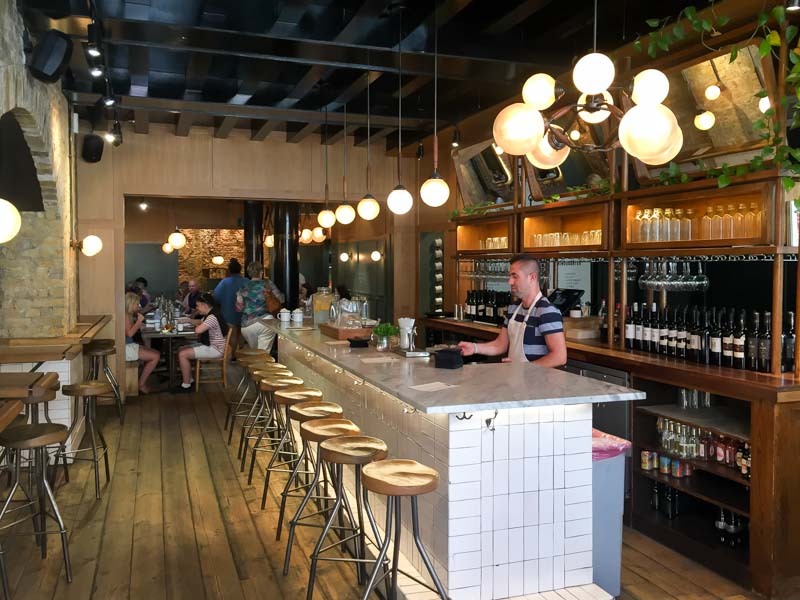 The rustic and warm interior beckons diners to settle down for a hearty meal, and the service staff are always smiling and ready to help. 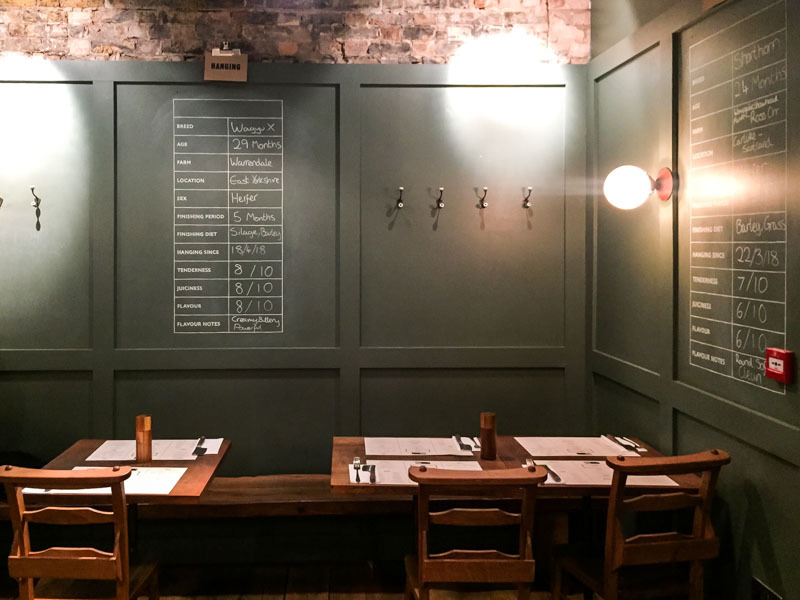 The menu is very straightforward, but if you need a bit of a meat education, just glance at the useful tables of info on the walls. The flat iron steak is the name of the game here and that’s what you should go for unless you’re feeling fancy and want to level up to another special cut that’s only available while stocks last. When I was there, Hereford Rib Eye (£16, approx. S$28.60) was the special option but I decided to stick to what I know and love (and can afford). Flat iron steaks are increasing in popularity and it’s the cut from the shoulder of the cow. It used to be considered a “waste cut” because of the tough piece of connective tissue that runs through the middle of it. 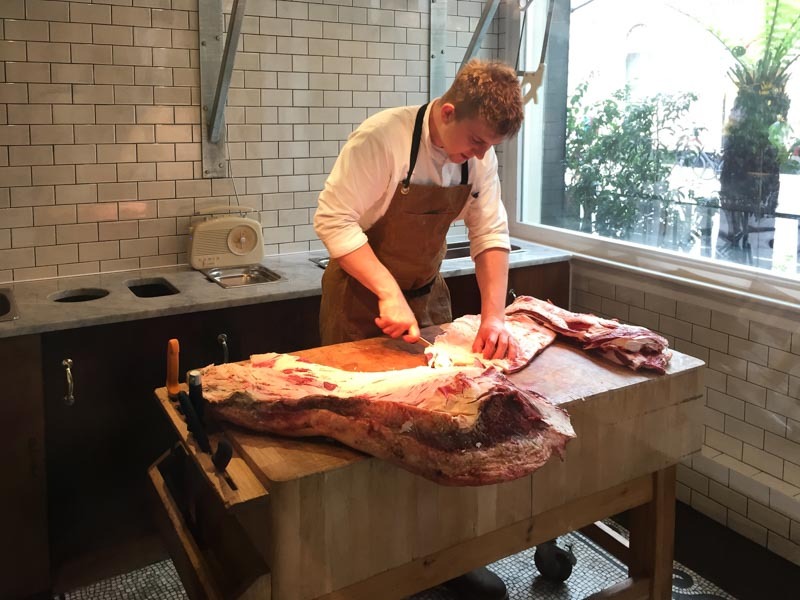 Once a method was found to cut that bit of tissue out, the world was left with a flavourful and tender steak that boasts a significant amount of marbling. In other words, order this and you won’t be disappointed. Another thing I love about this steakhouse chain is that you can snack on free popcorn while you wait. Nuts and crisps are so 2017, amirite? Just don’t get too full because you’ll want to get some sides to enjoy with the main event. Not long after ordering, wooden boards of juicy goodness arrived at our table. The Flat Iron Steak (£11, approx. S$19.70) only comes with a side of house leaf salad, so that’s kind of how your bill racks up (sneaky). But hey, you’re on holiday, right? My dining partner and I also ordered two sauces (£1, approx. S$1.80 each) and two sides to share. By default, the steak is served a glorious medium-rare, so if you would like yours done differently, don’t forget to let the server know when ordering. This is definitely the right doneness to enjoy this cut though, and the steak is simply seasoned with kosher salt. 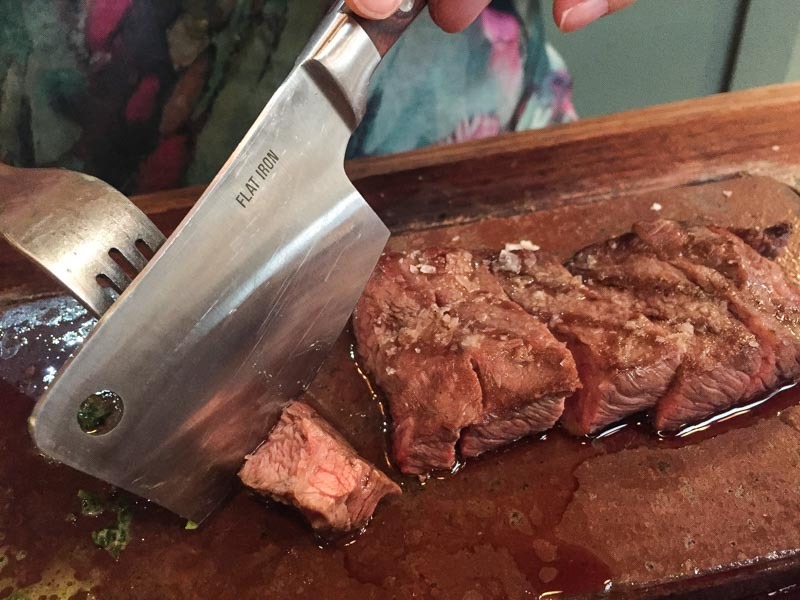 Instead of a steak knife, you’ll be given a mini meat cleaver to cut your steak with; slightly gimmicky, but nonetheless effective since the steak is already sliced up upon serving. Eaten on its own, the meat was extremely tender, and melted in my mouth a little. The natural flavours really shone through, and I was instantly reminded of why this was my fifth time returning (even after the little cheeky price hike). Next, I tried dipping a piece into one of the sauces. The Fresh Horseradish Cream (£1, approx. S$1.80) gave each bite a kick (sort of like wasabi), but it overwhelmed the flavour of the steak a little too much for my liking. I much preferred the classic Bearnaise (£1, approx. S$1.80), which was more mellow but still creamy and herby. The other two sauces that you can opt for are Peppercorn and something called Fred’s Sauce, which is a house made spicy tomato sauce. Honestly though, the steak was delicious on its own. If you don’t like change, then the obvious side to go for would be Dripping Chips Batch #128 (£3.50, approx. S$6.25), which are basically fries. But if I were you, I wouldn’t miss out on the Roast Aubergine (£4.50, approx. S$8.05). 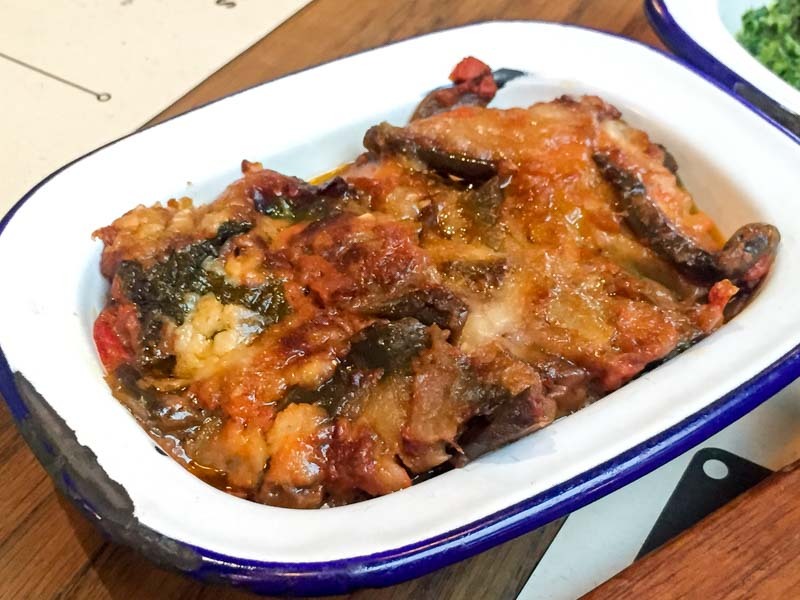 A medley of aubergine, tomato, basil and parmesan was roasted to perfection and made for a delicious combination with the steak. I sort of used this as a sauce for the meat, since the chunks were soft and creamy enough. 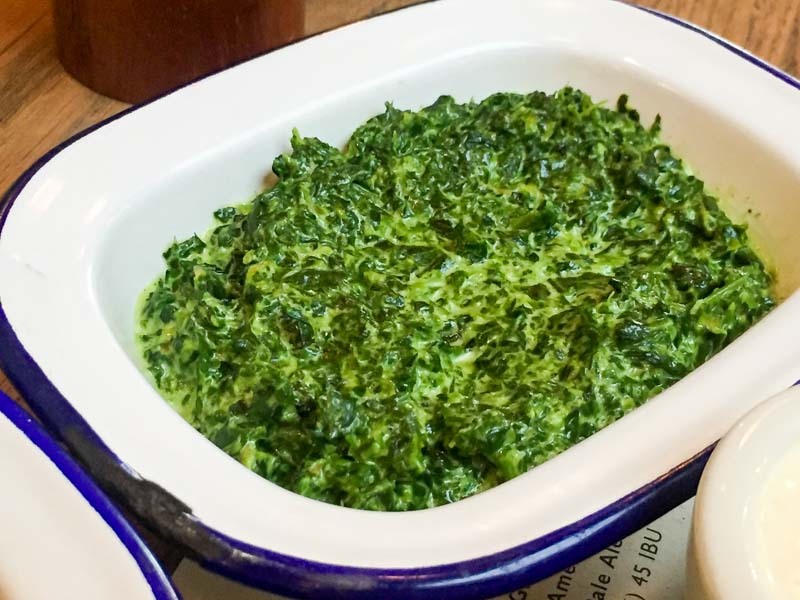 Another totally sauce-able side would be the Creamed Spinach (£3, approx. S$5.35) which was seasoned beautifully. All the sides come in quite generous portions so they’re very suitable for sharing – just go in a bigger group and try them all! It is SO WORTH the calories! 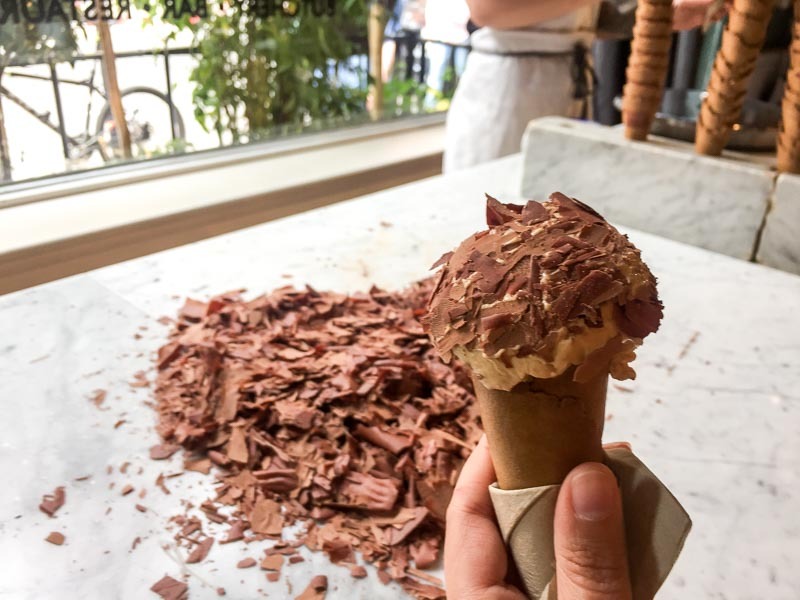 Flat Iron Covent Garden takes the ice cream ending so seriously that there’s even freshly-grated chocolate as a topping. 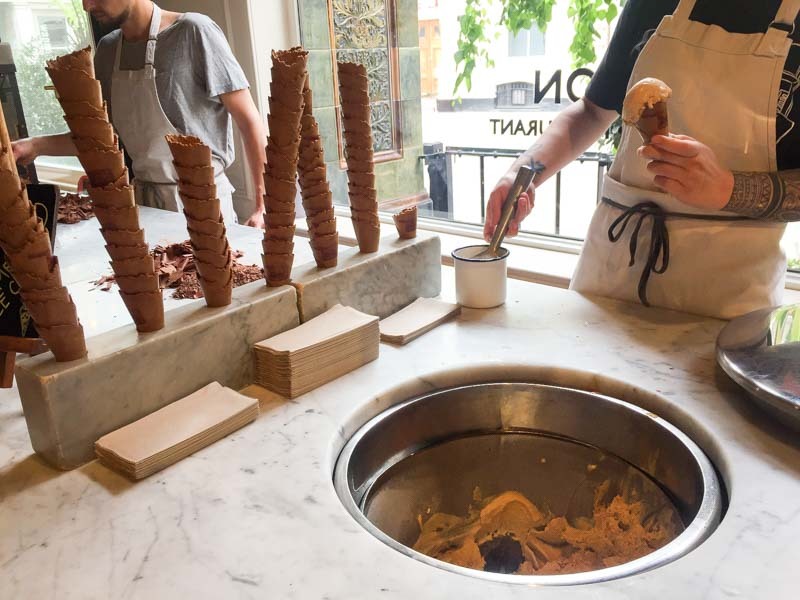 You can get your cone right by the entrance before you leave, and enjoy the dessert while you explore whatever else is on your London itinerary. The Salted Caramel flavour was a good blend of sweet and salty, and the chocolate shavings just made it so much more decadent. 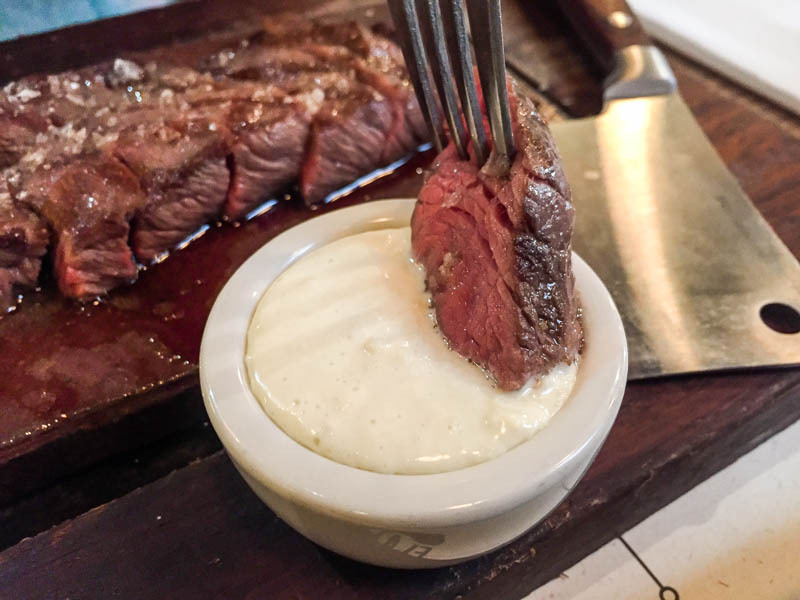 Affordable steak in the heart of London and free ice cream after? 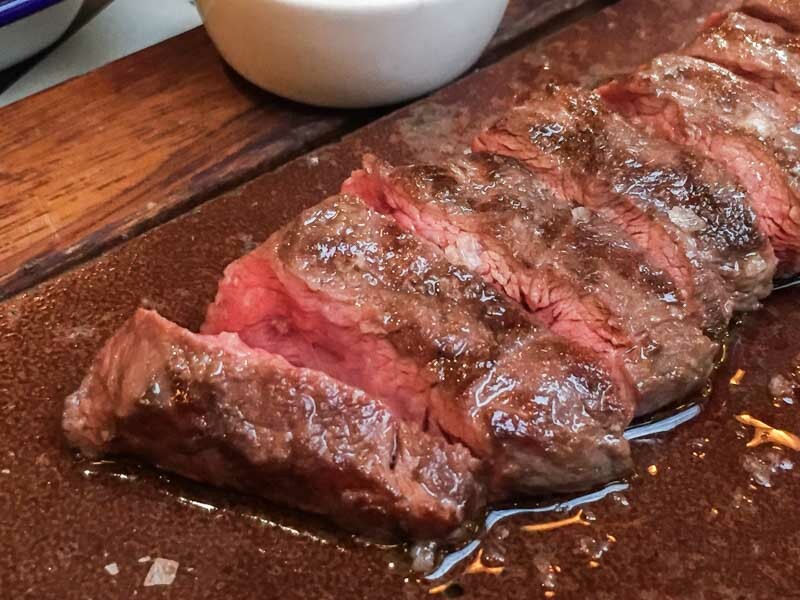 Flat Iron needs to be on your London food bucket list, alongside the standard visit to Burger & Lobster and the even more value-for-money Beigel Bake.